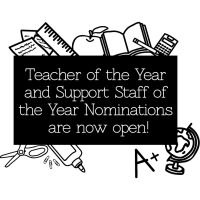 (Easton, MD) Talbot County Public Schools is excited to announce that the process to select the 2019 Teacher of the Year and Support Staff of the Year has begun! Is there a teacher or member of the TCPS support staff who is truly outstanding, has made a significant impact on your family, and/or goes above and beyond in their commitment as a professional? The Teacher of the Year and Support Staff of the Year programs are a fantastic way to recognize educators who exemplify this year’s theme, #WeAreTCPS.